Gentle Giant - Similan & Richelieu Rock liveaboard. 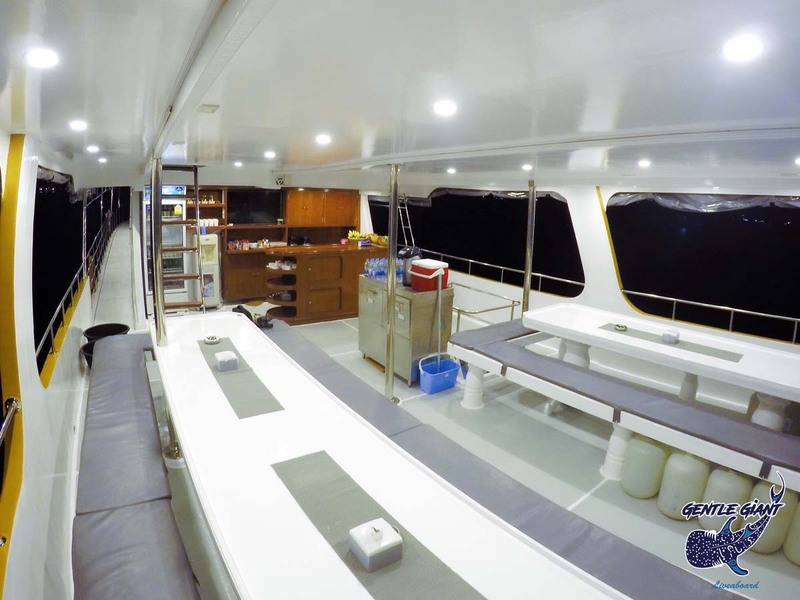 MV Gentle Giant is the perfect Thailand liveaboard diving boat for divers who want to visit all of Thailand’s best dive sites. Instead of only visiting The Similans & Richelieu Rock, or Hin Daeng & Koh Haa on each trip, Gentle Giant combines them all. 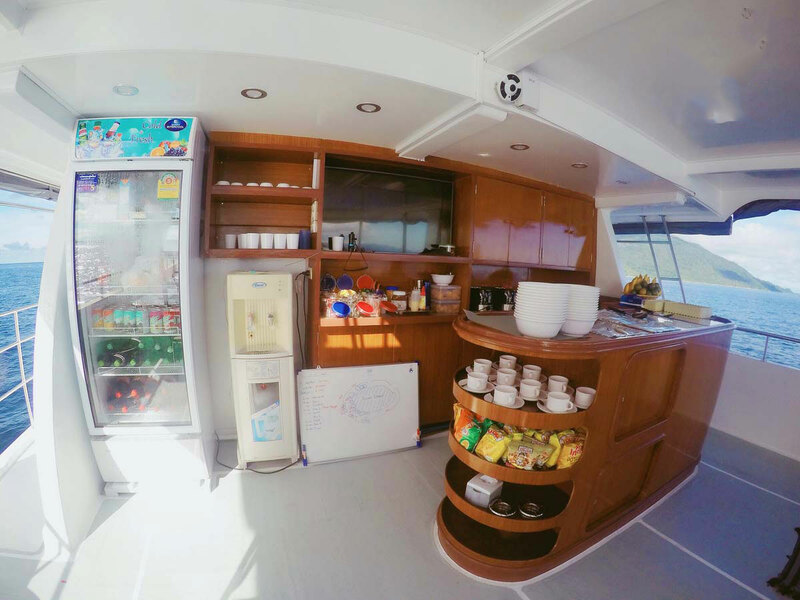 The boat was totally renovated in 2017 and it has ten clean & comfortable guest cabins, plus air-conditioned & outdoor communal areas. The crew & dive staff are all experienced, knowledgeable, patient & friendly. The food is delicious, and the itineraries are unique. 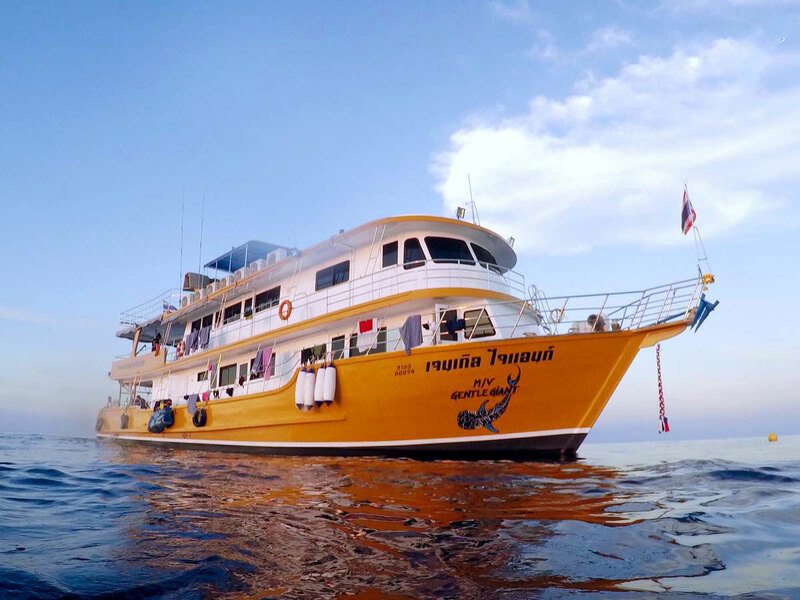 It really is a great choice for 5 Day / 5 Night liveaboard diving cruises in Thailand. 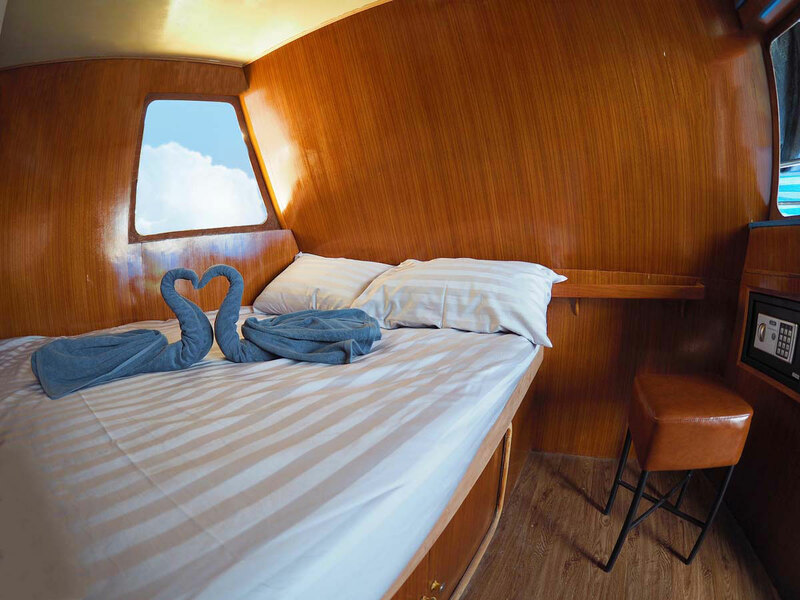 The ten cabins on Gentle Giant all have air conditioning, a private en suite bathroom, mini safe, and windows & doors which open out onto the deck. 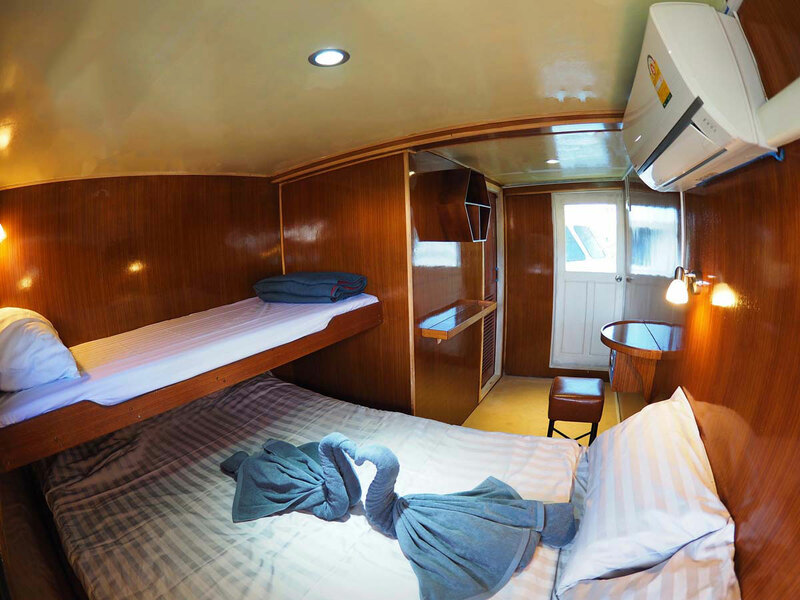 On the upper deck is the master cabin, which has a large double bed as well as a single bunk. 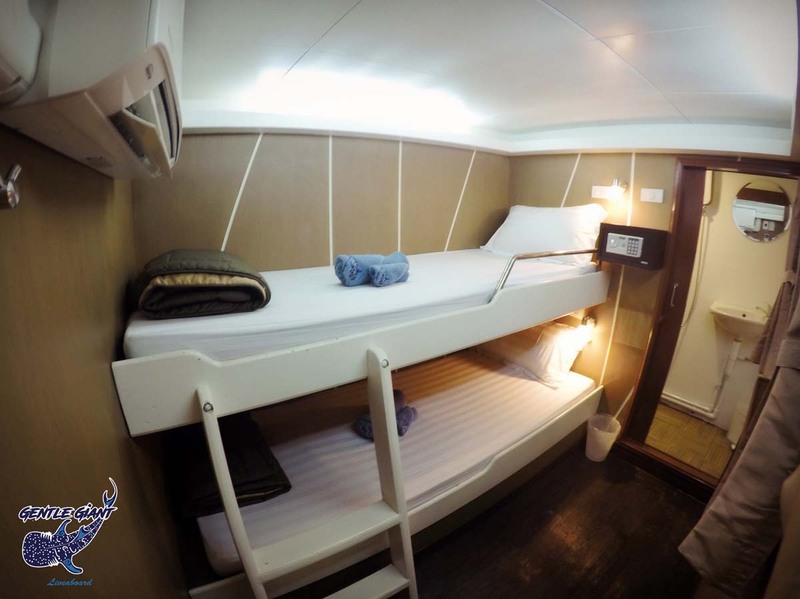 At the front of the main deck is the deluxe double bed cabin that might look small in the photos, but actually is the width of the boat. 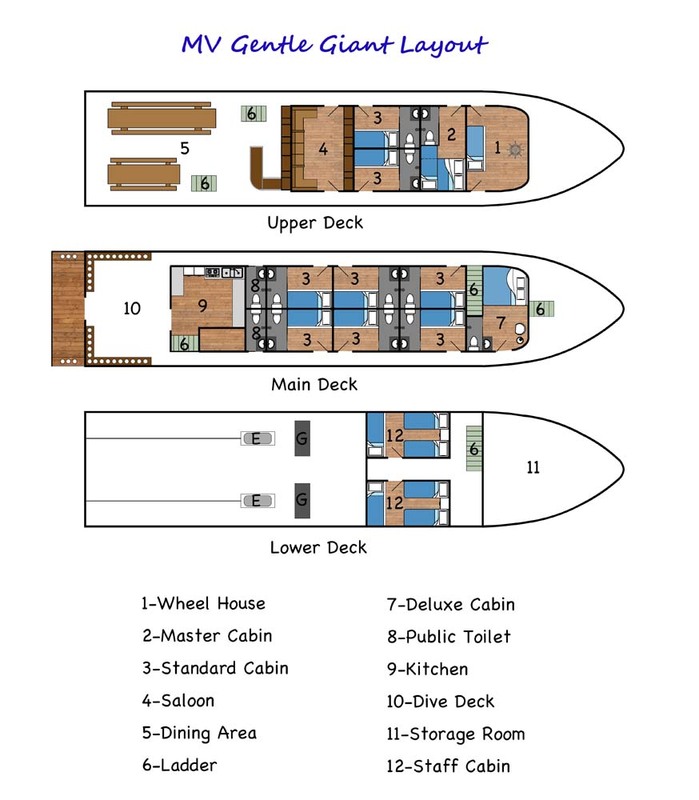 There are eight standard cabins, which have twin bunk beds. 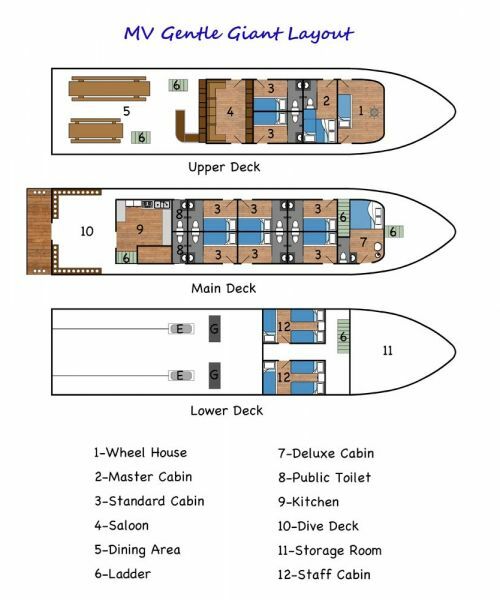 Two standard cabins are on the upper deck and six are on the main deck. 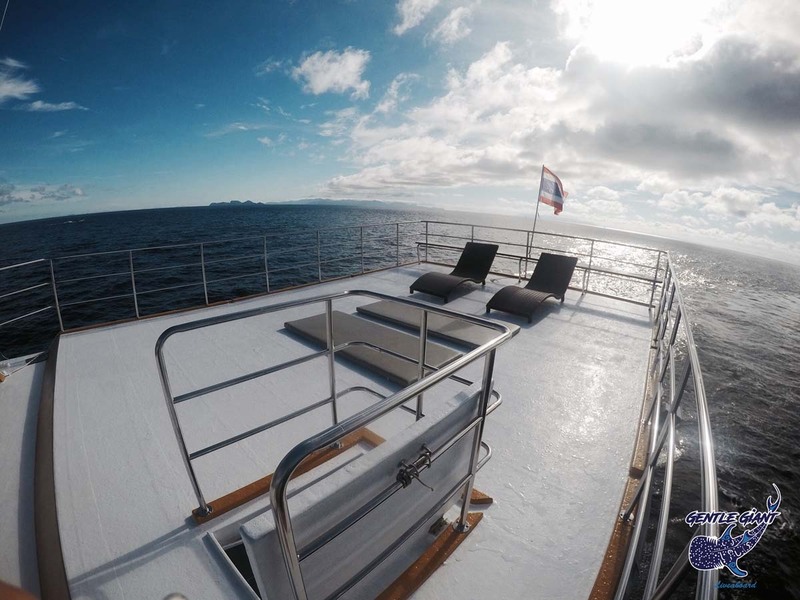 Between dives, most guests spend their time on the upper deck. Here there is a large outdoor dining area, which gives panoramic views of Thailand’s Andaman Sea. 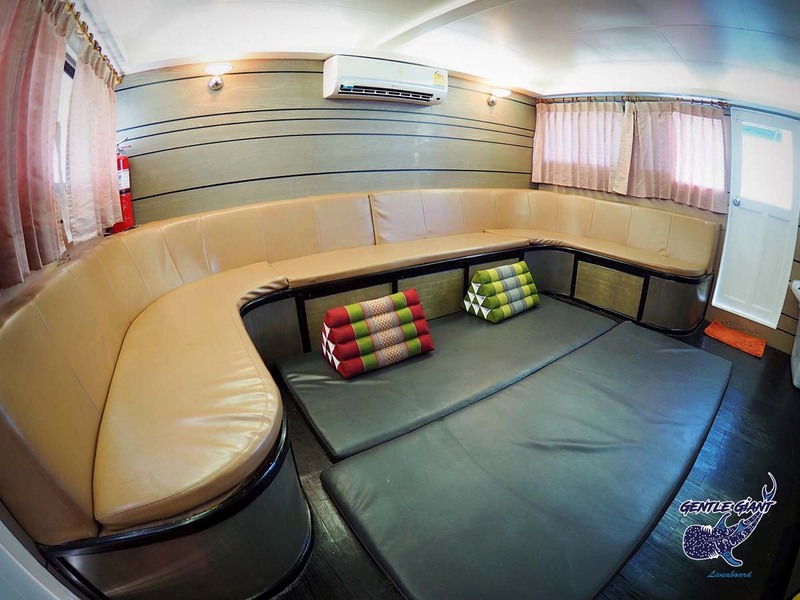 There’s also a large indoor air-conditioned lounge saloon. 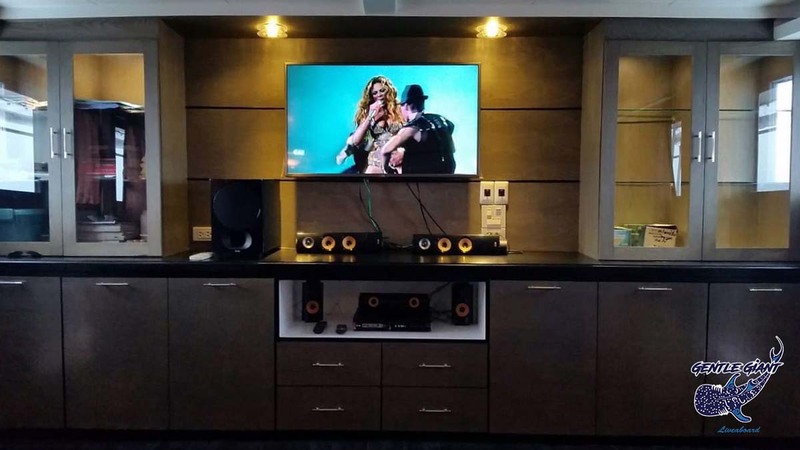 Here, guests can show or view photos or videos of the day’s diving or watch a movie on the huge tv, or just take a break from the sunshine. 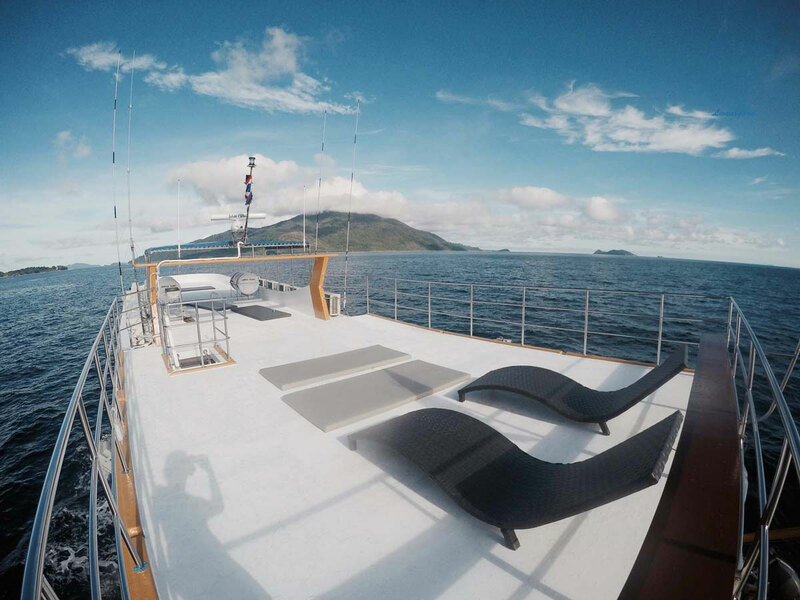 There is also a large sundeck, where you can enjoy the sea breeze and top up a suntan, or gaze at the stars during the evening. Delicious meals are served buffet style on the upper deck. 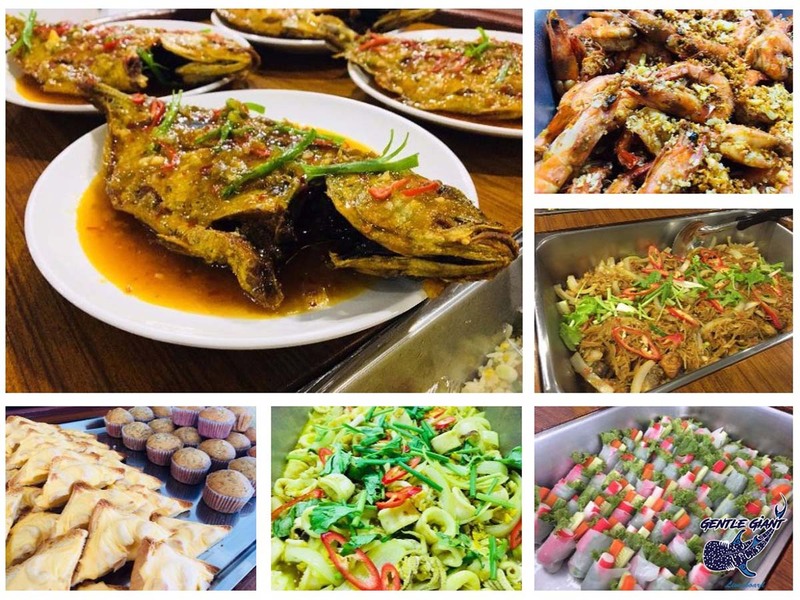 The food is a great blend of Asian & western cuisine that’s not too spicy. If you have special dietary needs, this is fine but please let the team know in advance. Fruits, snacks, soft drinks, tea, coffee & water are always available for free. Beer is available for reasonable prices, but only after your final dive each day. Gentle Giant’s dive platform is large and well organised. 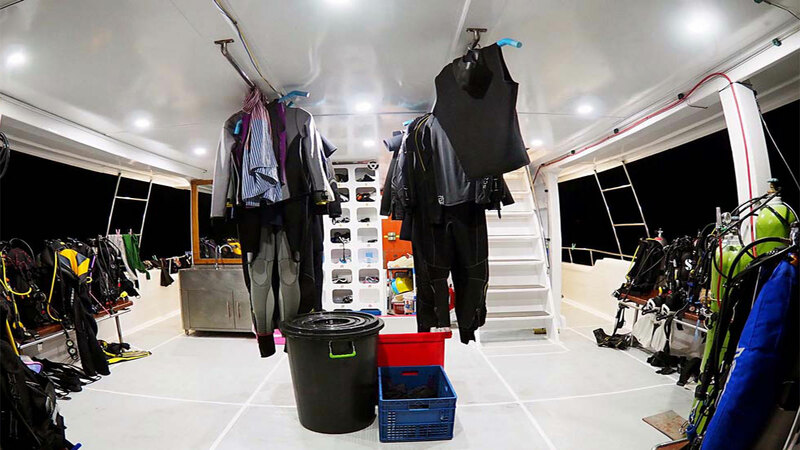 At the start of each trip each diver is given a ‘tank slot’ and this is where your gear remains for the trip. Nitrox blending and the compressor work quietly to fill tanks quickly but not disturb guests. 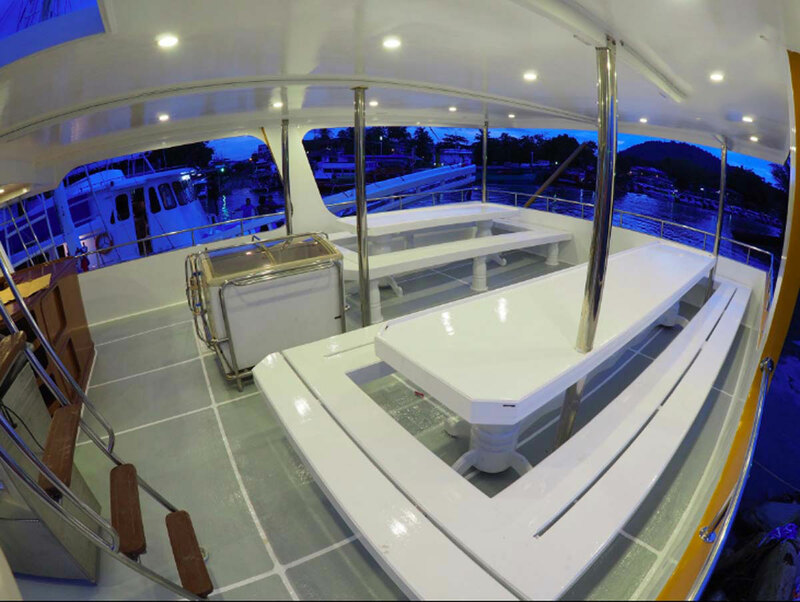 Unlike all the other boats, Gentle Giant has an itinerary that visits all of Thailand’s best dive sites. Most Thailand liveaboards sail from Tab Lamu in Khao Lak to the Similans, Koh Bon, Koh Tachai & Richelieu Rock. Some sail from Phuket to Hin Daeng, Hin Muang, Koh Haa, Koh Phi Phi and the best of Phuket. Gentle Giant visits them all, sailing from & returning to Phuket. This is achieved by crossing the long distances during the night, which doesn’t affect the guests’ convenience. Gentle Giant is large enough to be safe, & comfortable. There’s a full complement of safety & communication equipment, as well as a motorized dinghy. Gentle Giant’s itinerary starts & ends in Phuket. Departure is in the evening, with the first dive the following morning. The first three diving days are at Similans, Koh Bon, Koh Tachai & Richelieu Rock. 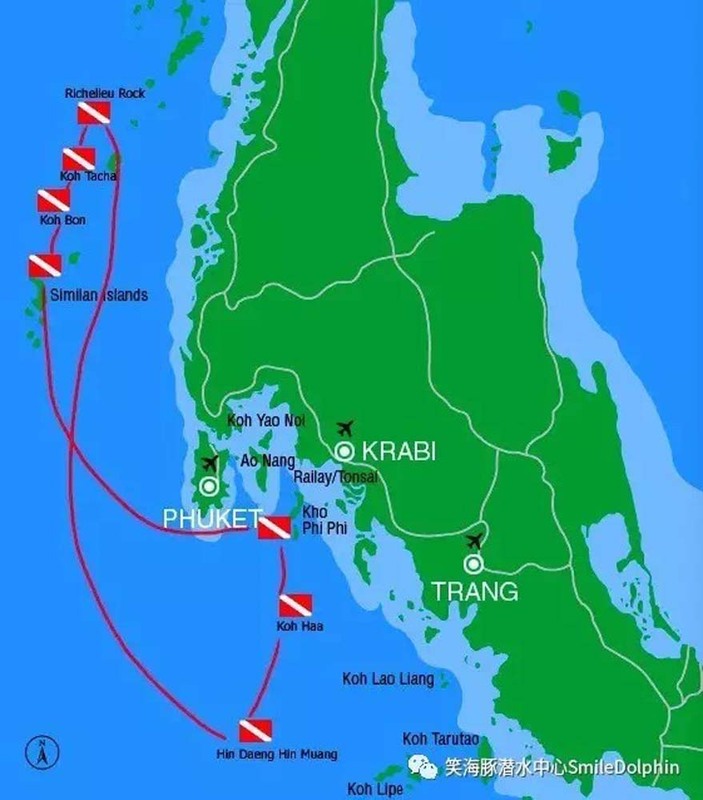 Then the boat sails south to Hin Daeng, Hin Muang, Koh Haa, Koh Phi Phi & King Cruiser Wreck. Please beware that some websites show the trips to be 6D/5N but this is misleading. The trips are 5D/5N. You depart in the evening of the first day, and there are five diving days. You disembark in the afternoon of the fifth day. Generators: 3 X 40 Kw. 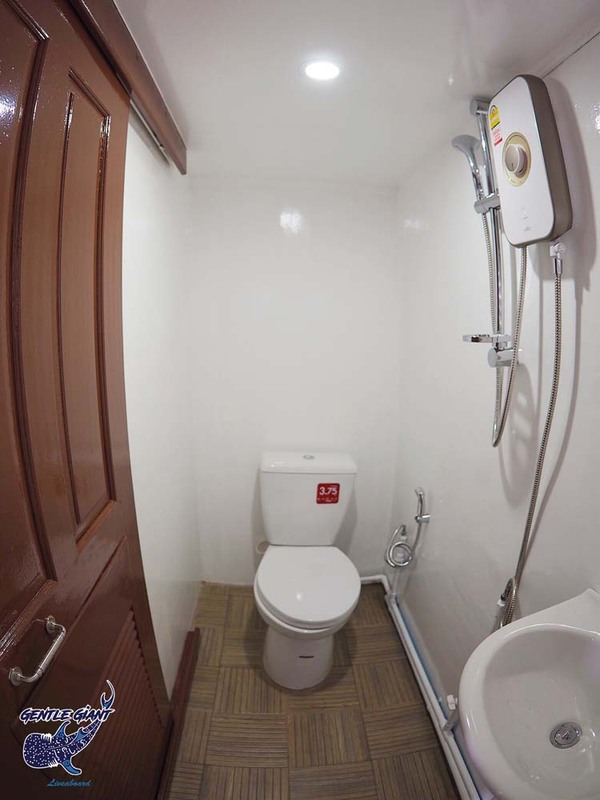 Rest Rooms: 10 En-suite, Plus 2 Seperate Showers & Toilets. Safety: Life Raft, First Aid Kits, Life Jackets, Fire Extinguishers. Navigation: GPS, Sonar And Radar. A range of PADI scuba diving courses are available on Gentle Giant, but you need to book in advance. The most-common diving courses are AOW (Advanced) and Nitrox Enriched Air. Scheduled transfers from around Phuket are available during the early evening of departure day. The boat departs from and returns to Asia Marine Pier on the east coast of Phuket. National park fees (2,500 THB) rental equipment & alcoholic drinks are paid on board in cash.